“Everybody’s got to eat.” Your misfit party of unusual creatures gathers in The Sleeping Lion to search for a lead to their next bit of coin. Each of them has their own secret motivation for putting their life on the line for a mercenary contract. But at the end of the day, one necessity unites them. You’ve got to eat to live. And if you live to fight another day… well, you can make a bit more coin. So begins the campaign of Gloomhaven, designed by Isaac Childres of Cephalofair Games. What starts as a simple mission rapidly turns into a sprawling campaign that takes you to the mountains, swamps, forests, plains, and caverns of the land surrounding the dusky city of Gloomhaven. You will even explore a bit of the city itself as the narrative unfolds. 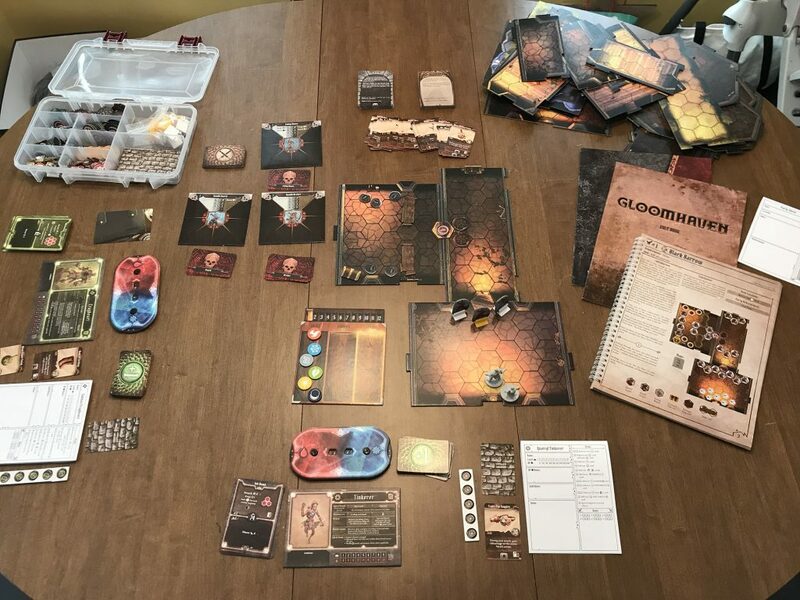 Gloomhaven is a campaign-style game for 1 to 4 players that combines tactical combat with role-playing elements to create a board game experience that is impressive and daunting in scope. The story behind Gloomhaven is equally impressive. What started as a personal Dungeons & Dragons-campaign-turned-board game, that first launched to the relatively modest tune of $386,000, quickly gained early critical praise and burgeoning word-of-mouth that spawned a second printing that amassed 40,600 backers and almost $4 million. Isaac Childres, you’ll be eating just fine for a long time. Now that the second Kickstarter is arriving in the hands of backers and retail copies are filling store shelves, I want to explore how the game works, and share some expectations to help you determine if this is a game you’d enjoy. The game primarily takes place in two different arenas. 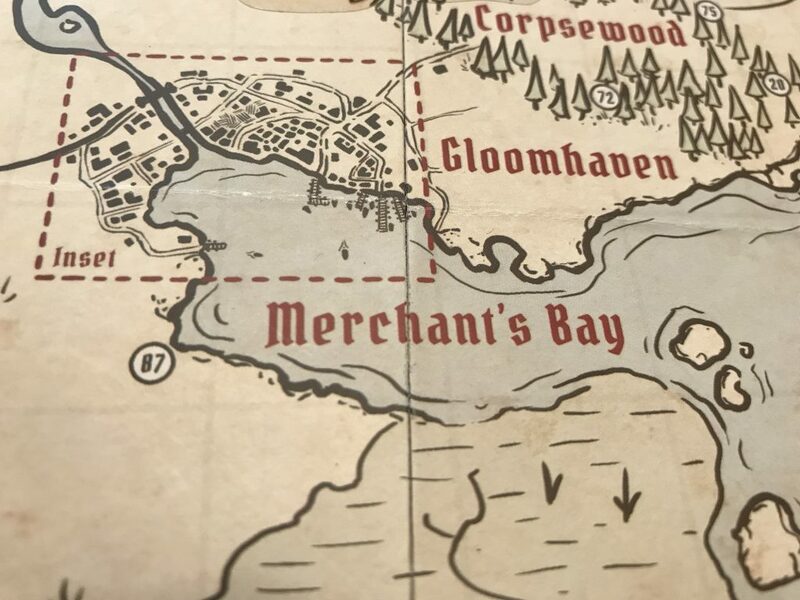 First, you can visit the city of Gloomhaven. Here, your party can perform several activities that allow you to manage your party. You can shop for new items or sell worthless items back, level-up characters and select new action cards for your deck (more on this later), donate money to the temple to become “blessed,” enhance your character, complete a City event card, and even retire a character. Once your party is set, it’s time to adventure. The second area of the game is playing a Scenario, where your party crashes through a dungeon to complete a specific objective, usually along the lines of “kill all the ugly things.” This is a cooperative game, so all players are working together to accomplish the scenario objective while the game advances against them to exhaust their characters. 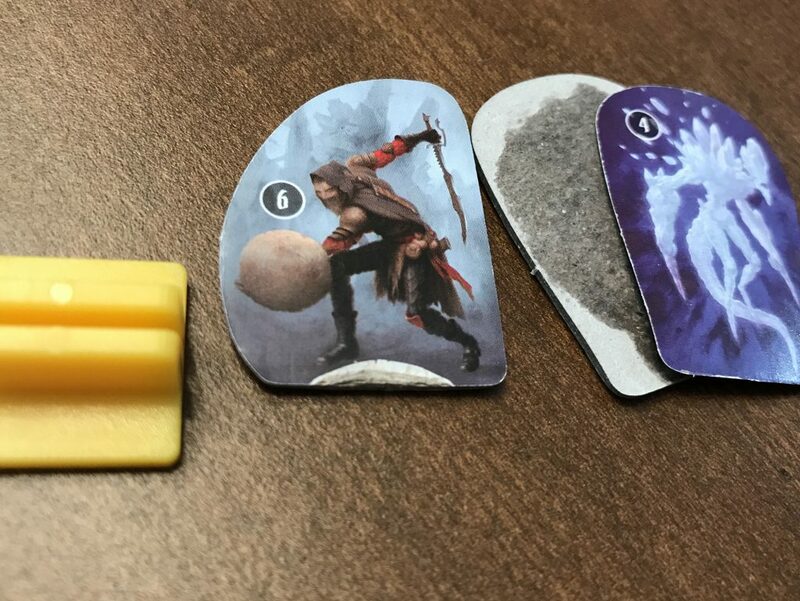 Gloomhaven employs a unique dice-free combat system. Each player controls their own character by utilizing a deck of action cards with numerous abilities. The action cards are divided into two sections, with each section containing a separate effect. Typically, the top action is attack-oriented, while the bottom action relates to movement or support abilities. On each player’s turn, they will choose two cards out of their hand, and trigger the top action on one card and the bottom action of another. As players resolve their turns, some cards will go to the discard pile, which will be refreshed when the player chooses to “rest” their character, while other cards are “lost” and cannot be used for the remainder of the scenario. Every time a player rests, they must also lose one action card to the “lost” pile. Therefore, players must wisely choose when to rest and use “lost” card abilities, because their hand of cards (and thus, available actions) will shrink over time. Run out of cards, and your character becomes exhausted and is out for the remainder of the scenario. The moment the players complete the scenario objective, they win! Completing scenarios is an exciting event unto itself because players will gain experience bonuses for their characters, extra gold, and most importantly, will unlock new locations for further adventures in the form of illustrated stickers which are placed on the Gloomhaven map board. If all players become exhausted or are otherwise unable to complete the objective, they lose. Yet, even if players lose a scenario they still keep all gained experience and coin. This is a very welcome feature I wish more dungeon crawlers would implement, because you still feel like there’s some progression even if you must replay the scenario. The map board adds an immersive touch as it displays the details of the realm. It also contains a surprising number of functions. 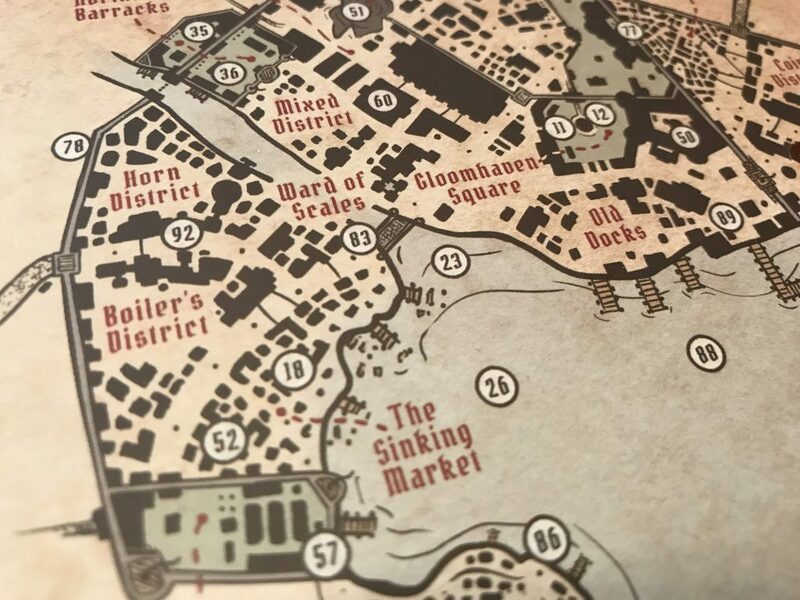 In addition to being the hub of all the locations that you can explore, it also tracks the party achievements that you’ve unlocked and the “prosperity” of the city of Gloomhaven. As the city becomes more prosperous, new items will be featured in shops and new Events can be triggered. And when you start a new character (such as after retiring another), the prosperity level dictates the starting level with which you can begin your new adventurer. It also tracks your progress in the game through unlockable achievements that take the form of sticker banners that are displayed across the top of the board. If you haven’t heard of the “legend of the box” the first thing you need to grasp is… this thing is HUGE! 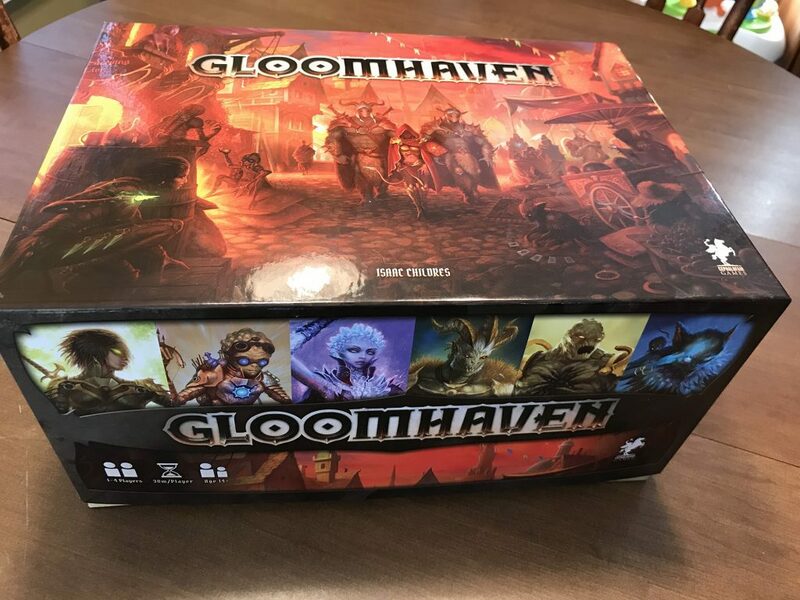 Gloomhaven is a 22lb box stuffed to the cardboard with content. If you want to boost your real life “Strength” stat, just do a few reps of curling this box. Gloomhaven contains 17 character classes, with 6 immediately available to open. The rest must be unlocked as you play the game. 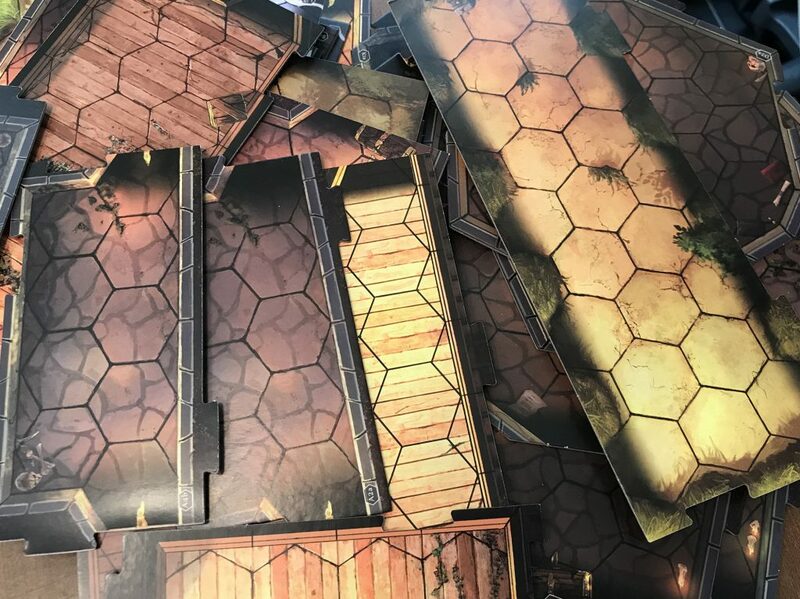 Aside from the packages containing your character components, you’ll also find a large board representing the map of the city of Gloomhaven and the surrounding terrain, and a plethora of map tiles that you’ll use to construct the various scenario dungeons. You’ll also find hundreds of cards for items, attack modifiers, Road events, City events, monster activations, personal objectives, battle objectives, and even random dungeon generators if you want to play “off the grid.” Throw in a pile of tokens for obstacles, traps, objectives, status effects, money, treasure, furniture, doors, and… well… you get the idea. Many trees died to make this game. And a few lumberjacks leveled-up. Touting over 100 hours of gameplay (in this reviewer’s opinion, it could easily be double that), the cost-to-content ratio itself makes the game easily worth the entry. With 95 main missions, and a few surprises to open at the right time, there’s enough content to keep you occupied for an era or two. Gloomhaven is the closest thing I’ve seen at turning a sprawling open-world RPG video game and translating it to board game form. The game isn’t perfect, however, as pulling off a feat this size doesn’t come without some downsides. First, the map tiles and enemy tiles are a thin cardboard and there have been complaints about the cardboard separating. I have personally experienced a map tile splitting. And several of my monster standees are splitting as well. You must carefully slide monster standees in and out of the thick plastic clips or risk damaging the monsters, and not in the intended way. I do understand that the map tiles are more than likely a thinner material because if they were any thicker, they simply would not be functional to fit back into the box. For practical manufacturing and spatial reasons, I’m not sure how much thicker the boards could have been. Second, the dungeon tiles can be slightly repetitive and the art is a bit bland. There’s just not much going on in the map tiles. This can be overlooked in that the grid lines for movement are clear, and you won’t lose track of things amidst a busy background. There is also very little art anywhere else in the game beyond the map tiles, character boards, and standees. Most of the cards used in the game are simple but clear text with color coordination to help with identifying card type. The miniatures are fantastic, however, and come in great variety. One of my favorite things about Gloomhaven is that it does not feature the same old races you are used to. This is not the land of Tolkien’s merry men. In Gloomhaven, you’ll encounter incredibly distinctive races from the alienoid Quatryls, the crystalline Orchids, the rat-like Vermlings, and the giant horned Inox… Inoxes? What’s the plural of Inox? And as varied as the races are, so are the classes. Knight, mage, archer, and thief? Nope! How about trying your hand at the Cragheart, which combines both tank-like attacks and with elemental ranged magic? Or the Mindthief, who has very low hit points, but prefers to manipulate opponents and strike in melee range? Or the Tinkerer which has numerous healing options, but also can create traps, decoys, and shoots at range? Having played all the starting races, it is amazing how different they play from one another. Each class tends to play like a hybrid of familiar classes which only adds to the depth when you begin to level-up your characters and select new abilities. When you gain the ability to enhance your abilities, which is unlocked through gameplay, you can place stickers on your ability cards which allow you to alter their functions. For example, you can give your melee splash attack an elemental effect, or your ranged attack a stat boost, or add a negative condition to effect enemies on your character movement. Throw on the fact that each character has a list of unique perks that you can unlock while playing them, which often add new attack modifiers to their attack deck, and the depth which you can tool your character would make any hardened Tinkerer happy. Obviously, Gloomhaven is a deep game. I haven’t even mentioned everything going on in the game because the game is as deep as the box lets on. But is this game for you? 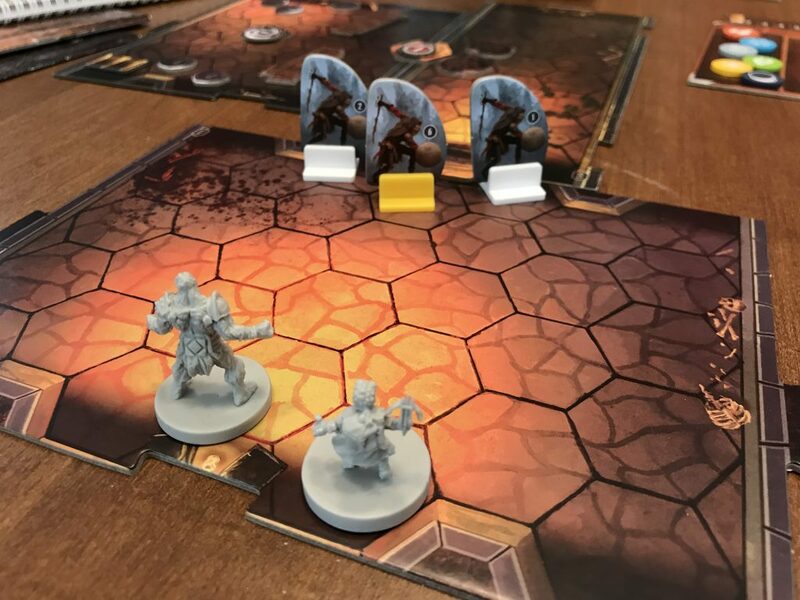 A few expectations will go a long way to see if you’ll survive in the realm of Gloomhaven. First, know that your first few games may take a while to complete. Your players will have no idea how to translate the effects of their available ability cards until you start playing. 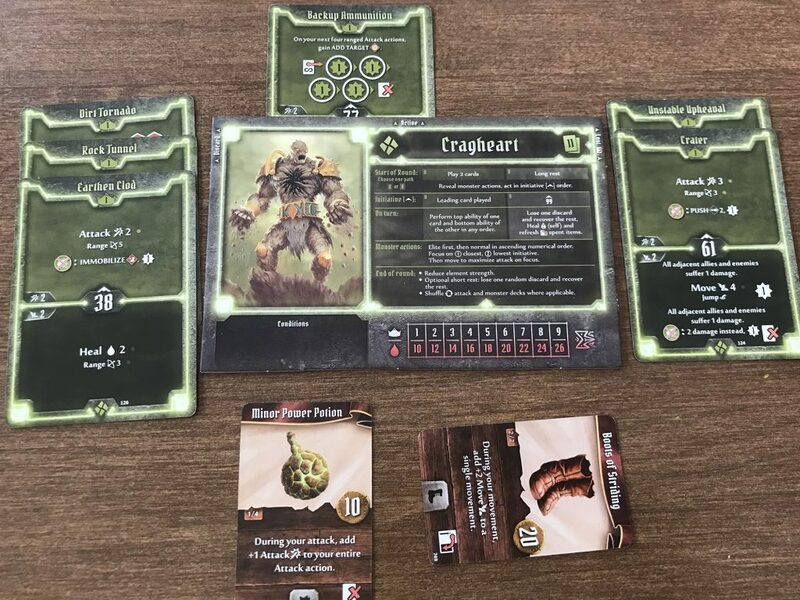 Whereas many games give players few options to start and builds upon those options as you play, Gloomhaven gives players a full deck of abilities to start that shrinks as you play. Your first few turns will literally be sorting through all your cards to select two that can be your opening move. It can feel daunting your first couple of times playing. Second, the game has a very long setup and teardown time. Each dungeon is totally unique and must be constructed from the massive pile of items in the box. You’re not only placing map tiles, but you also need to set up obstacles, traps, map features, enemy standees, enemy cards, attack decks, and more. You will need a very large table, worthy of the Sleeping Lion tavern, to play the game. Unless someone has an ingenious way of keeping them separated, just selecting the correct and required number of enemy standees from the box is its own challenge. Third, Gloomhaven is a strategic tactical combat game. It’s not a run n’ gun dungeon crawler. This plays more like a cooperative tactics-type video game with a deeply robust character management system. Positioning, movement, action selection, and teamwork are far more fine-tuned here than similar games. 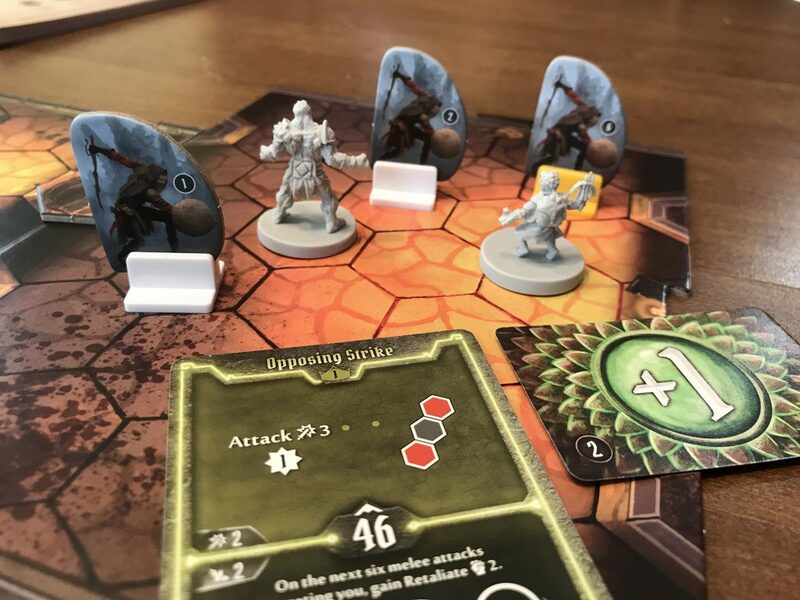 Players who want a fast-paced action game may find Gloomhaven playing with a slow pace at first. When gathering you party, it may be best to explain the above expectations to them. I’d encourage all players to take their time and enjoy the first few games as learning opportunities. Create an easygoing pace for players to learn their character and try not to rush things. The game will pick up speed as players learn their characters and become familiar with the action cards. A host can help speed things along by having the game completely set up before the game session begins. Most of your early sessions will probably be around the 2 to 2.5 hour range, which isn’t that bad for a game night. One reason I like to play board games is that it provides an opportunity to be transported into a different “world” along with some friends (and some cookies and sugary carbonated beverages). And Gloomhaven is a game that beckons me to return like few other games in my collection. There is a mysterious, vibrant, and persistent world packed into the box, and that itself is a crowning achievement. Beyond that though, the game is just plain fun. I love the fact that Childres created brand new races that populate the world of Gloomhaven. This immediately invites players to “come, see what the denizens of this world have to offer.” You don’t feel like you’re playing the same ol’ dungeon crawler the moment you open your first miniature box. And the fact that the classes play so uniquely is a bonus. Who would have thought that a tiny rat creature who has the lowest hit points of all characters would function as a melee character, and it works!?! Yet, it does. Isaac Childres is a mad genius whose design is meticulously crafted, and rewards players for not merely strategizing well, but getting to know their character’s advantages, disadvantages, and patterns and tuning them accordingly. It is also extremely satisfying when your group starts pulling off explosive combos with their moves, or when one player nails a perfectly timed attack that saves another player from getting hammered. The action cards grant some much-needed improvements into the typical dungeon delving fare. First, Alpha gaming is decreased, as players all secretly select their actions for the round at the same time. Second, every round ends up playing slightly different in player order, which keeps players on their toes. 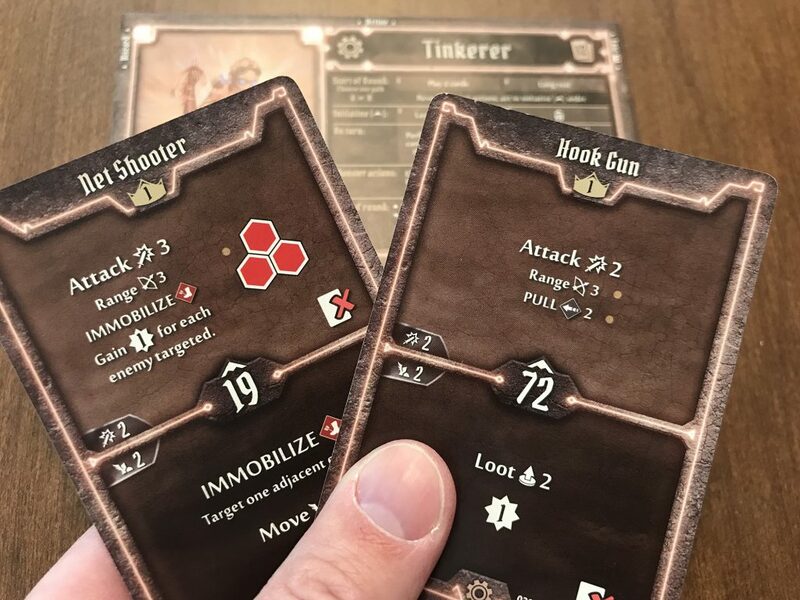 Once action cards are selected and revealed, players take turns in an “initiative” order that’s indicated with a number on each card. I may be the last character to go in one round, but in the next round, I’m the lead hitter. Swing away, dear Inox, swing away. The sense of discovery is unparalleled to most games on the market. 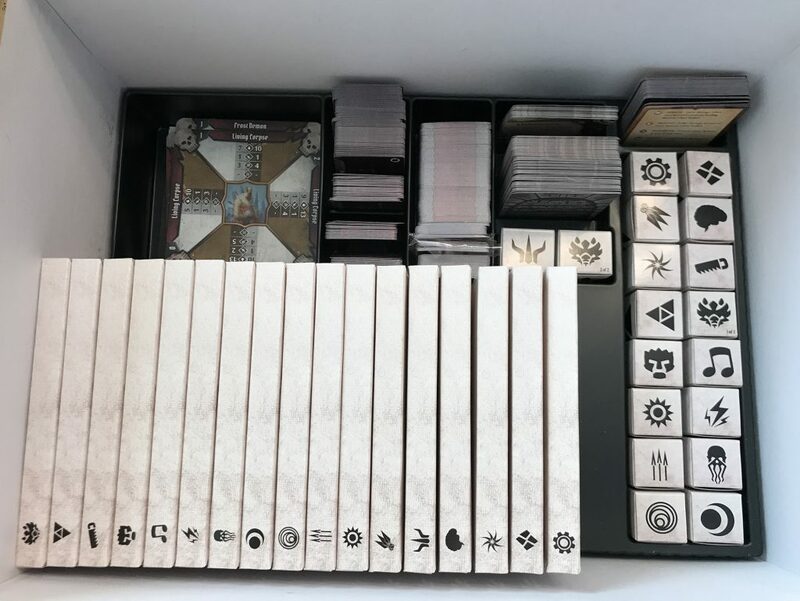 There are sealed character packets, dozens of hidden items to find, envelopes to open, a city to level, character abilities to unlock, stickers to place on cards, and locations to unearth. And your world persists through party goals and achievements, which are also tracked by placing stickers across the top of the board. As you unlock scenarios, you can eventually have multiple parties adventuring in the realm of Gloomhaven, with each party uncovering different storylines. And for all you nitpicky editors out there, the writing in Gloomhaven is immersive and witty. Let’s just say one encounter I had involved a stomach churning pie-eating contest. Great review! Love the pros and the cons. Just a quick question if I was playing this solo or 2 player which characters would you suggest? In theory any 2 characters will work, but there are some suggestions “out there” based on how the classes play. I’ll try to some up some thoughts without giving too much away. First, of the starting six characters, they are first most easily grouped by their starting hit points. So right out the gate, many people suggest you do not play a Spellweaver/Mindthief combo because they have the lowest HP in the game. A couple good critical attacks from the enemy will doom the party. Cragheart, Scoundrel= Mix of both. The Cragheart has a lot of ranged attacks and high HP which makes him a versatile character. However, his downside is he sometimes deals splash damage, which can affect adjacent heroes too. When playing 2p you also want to take into account your healing… and the Tinkerer and Cragheart both have decent healing options. The Tinkerer is the best of the starting 6. With that said… I find the Cragheart and Tinkerer a great combo to have lots of ranged attack, some tanking when needed with the Crag, healing with the Tinkerer. The Spellweaver would work well with either the Cragheart or the Brute. The Mindthief likewise should work with a Cragheart, Scoundrel or Brute. At the end of the day it comes down to the style you want to play. And then tune your items and equipment accordingly to make up for your deficits. Gloomhaven does allow for players to drop in and drop out. In fact, I think it’s actually more fun for new players to join after the original group has already done some scenarios, particularly if they’ve gotten to the point where new characters can automatically start at a higher level. The game really shines at higher levels once you can customize your player and attack decks. This is hands down the best overview of Gloomhaven that I’ve ever read. My wife and I have just taken the plunge and we have a friend with less gaming experience than we have who is planning to join us. She asked me to send her a good overview of the game and this is the one. Very clear description of the game, realistic set of expectations, and outstanding photography that really captures the essence of the game environment. Great job!